I purchased a refurbished Daisy 853 Air rifle from the CMP with the intention of having my daughter use it to learn how to shoot three positions for high power and small bore. Now that I have it she may never get to use it! I do not shoot that well with my AR's! Very nice...I'm thinking about buying an air rifle as well. might have to look at one of them.. Careful, you'll put your eye out with that. So that group is standing? Ok, nice! They are all more expensive than the M1 I got from them. We have one that my daughter used while on the JROTC rifle team and they sure can be accurate. I smoothed up the trigger a bit and her scores went up nicely. I'm not sure if the trigger was all that much better or she just thought it was. 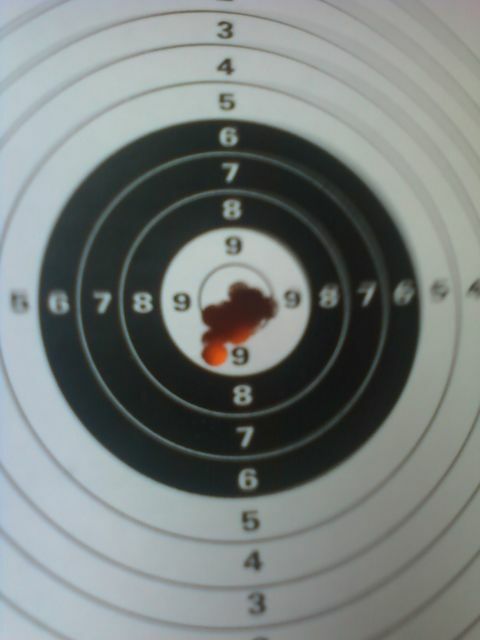 WOW...thatis purty good shooting with a pppphhhhttt gun DD. I have been threatening to get one for some time now...just to get rid of some pesky minor birds. Great fun. Maybe I got the one you worked on... I got a used one that has been refurbished by CMP - I have not put the pull gauge to this trigger but i doubt if it is over 5#. The used ones are only $115 delivered Slim. Yes that was off hand from 25 feet in my garage. I was using a shooting coat and working on getting locked in tight... it seemed to work. I worked on several of the guns that the JROTC was using at the time (2003?) and I have no idea what happened to them after the schools decided to eliminate the rifle team. However, hers is in a case in my closet! Vince, the 853s only have a muzzle velocity of around 550 ft/sec. Not the best bird killers, as I found out from personal experience. Thanks Punkin...they are also a little expensive for what I have in mind. Might just keep my eyes open for an el cheapo that will meet my needs. A friend of mine ordered one and his trigger is no where as good as mine. What was your trigger tuning procedure? Dawgdad, let me look at it again to refresh my memory, that was about 8 years ago. I remember that mostly I polished the contact points with a dremel tool using a felt buffer and some jeweler's rouge. I'll break hers down and take some pics this weekend.